The medical ultrasound market is expected to exceed $5B by the year 2015, driven by growth in hand-carried or portable ultrasound devices and the expansion of emerging geographic and clinical markets. Overall growth in medical imaging will also continue due to increasing populations worldwide, accompanied by a predicted increase in chronic disease rates. Reduced capital expenditures in the traditional medical ultrasound markets in the U.S., Europe, and Japan, however, are causing pricing pressure. As a result, ultrasound manufacturers are reducing prices on their established, traditional cart-based product lines, while simultaneously offering high performance, compact, low power ultrasound devices. 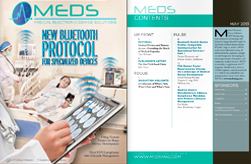 Compared with previous generations, medical ultrasound systems are now smaller, lighter, and more portable, with even higher levels of processing capability. This trend is expected to continue. Consequently, semiconductor manufacturers must provide medical ultrasound components with increased functional complexity at similar or reduced power levels. Likewise, systems design engineers will be continually challenged to source processors, interface components, amplifiers, and ADC/DAC components that deliver higher speeds, improved electrical performance and lower power consumption, at reasonable cost. The block diagram in Figure 1 shows a typical medical ultrasound system. The piezoelectric transducer signals from the body pass through the transducer/cable assembly and receive low noise amplifier (LNA) to the Variable Gain Amplifier (VGA). The VGA provides low gain for strong signal returns (signals reflected close to the body surface) and high gain for weak signals reflected from deep inside the body. At the core of the ultrasound system is the analog-to-digital converter (ADC) which converts the filtered input signals from the Analog Front End (AFE) into a digital representation which can then be passed to the digital beam former for further processing. Within the beam former the digitized signal is scaled and time delayed to create the focusing effect in the receive chain. The properly adjusted signals are then summed together across all receive channels and passed to the imaging system. Today’s medical ultrasound systems require multiple channel 10- and 12-bit ADCs with high signal-to-noise ratio (SNR) and low power consumption. Since medical ultrasound systems may require anywhere from 16 to 64 channels (depending upon the dynamic range and image quality required), each ADC should support multiple channels. This application also benefits from an LVDS (Low Voltage Differential Signaling) interface between the ADC output and the beam former. In this way, the data from the ADC can be serialized so that the interface between the ADC output and the digital beam former can be as simple as possible, while minimizing PC board area and cost. In order to address the challenges, Hittite Microwave has introduced a new line of octal 12-bit Analog-to-Digital Converters. The HMCAD1102, HMCAD1100 and HMCAD1101 are tailored to meet the strong demand for power reduction in high performance medical ultrasound applications. Table 1 provides a summary of the key performance specifications for the HMCAD1102, HMCAD1100 and HMCAD1101. 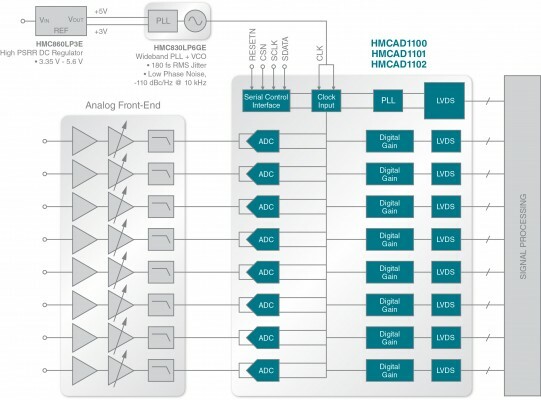 The HMCAD1102, HMCAD1101 and HMCAD1100 family are Octal 12 and 13-Bit ADCs which operate from 20 to 80 MSPS. Both 12-bit and 14-bit LVDS output modes are available and can be selected through the SPI control interface. Noise performance (SNR) at 50 MSPS with 8 MHz input frequency and 14-bit output is typically 72.2 dB, and 71 dB is worst case. Power dissipation at 50 MSPS is only 40 mW per channel, including the LVDS outputs. The HMCAD1102, HMCAD1101, HMCAD1100 family features a power down mode dissipating less than 10 µW and an unprecedented wake-up time of only 18 µs. In addition, a sleep mode with 0.5 µs wake-up time, and power dissipation of only 3 mW per channel, is available. These idle modes provide significant benefits in low power ultrasound systems. By switching the converter off during idle periods, the average power dissipation is reduced by 75% compared with active power dissipation. 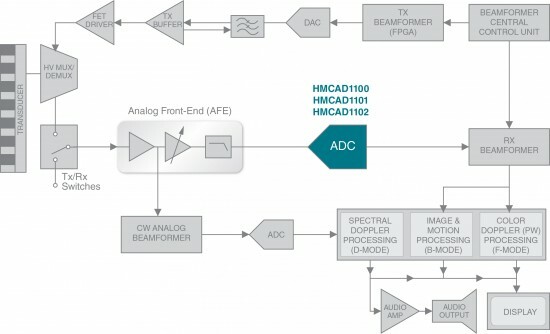 The block diagram in Figure 2 shows how the HMCAD1102, HMCAD1101, or HMCAD1100 ADCs can be interfaced to an analog front end (AFE) and a digital beam former in a medical ultrasound application. This application requires a very low jitter clock source, which can be implemented with Hittite’s HMC830LP6GE Fractional-N PLL with Integrated VCO. The HMC830LP6GE covers frequencies from 25 MHz to 3 GHz and provides less than 180 fs of double sideband RMS jitter and noise floor of -171 dBc/Hz in fundamental mode at 2 GHz. All three ADCs can be evaluated with the Hittite EasySuite™ evaluation kits, EKIT01-HMCAD1102, EKIT01-HMCAD1101 and EKIT01-AD1100. The evaluation kits are based on Xilinx® FMC (FPGA Mezzanine Card) SP601 standard motherboards, and feature Hittite evaluation boards with on-board ADCs connected to the Xilinx® board through an FMC connector. Hittite’s pre-loaded EasyStack™ firmware performs FPGA processing, while the EasySuite™ PC software tool performs ADC configuration, data capture and performance analysis.